That last part is my favorite of the film. #SoleSurvivorFilm thank you @ShawnPruchnicki and Paul Nelson. It was not a professional setting with Mark Rosenker in charge. Not at all. It was an inquisition. Watching #SoleSurvivorFilm . It's been intense, but it's done in the excellent documentary style we've come to expect from CNN projects. This #SoleSurvivorFilm on @CNN is something y'all. You are so very welcome Amy. Please show the girls someday the film when older. Line the cat box with the NTSBs. Its awful. Pilot error, u don't think so!! It takes a village to make an indie film & we received an outpouring of support from the vibrant film community in our hometown of Chicago. He was awful. In my personal opinion, probably the worst Chair the NTSB has ever had. This film is so moving. #SoleSurvivorFilm Much love to Jim!!! Debbie Hersman, is up there with Jim Hall, Lauber and in many ways better. She should have been the Sec. of transportation last year. #SoleSurvivorFilm Spending time with the families helped me find so much peace. She was close, huge mistake the WH made. Debbie is one of the smartest, kindest and toughest professionals I have ever know. Suffering doesn't have to diminish us. The human spirit is miraculous... It can transform pain into compassion, wisdom & intention. She would have been great in this position. Truly would have seen some major changes I believe. 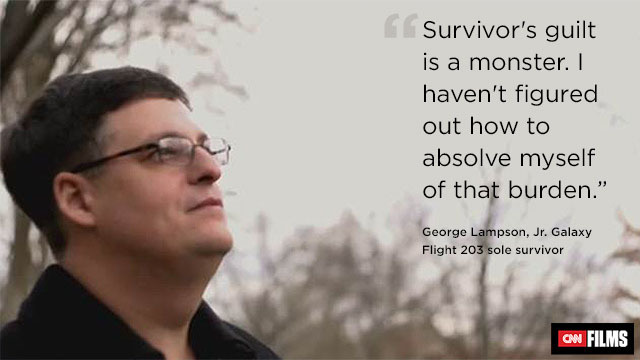 #SoleSurvivorFilm Many family members shared with me of a feeling of knowing something was wrong before the news. George, you helped us find peace too. Thank you. Watching #SoleSurvivorFilm on @CNNFilms . What a heart wrenching film. Tears are inevitable. I pray for peace for all those involved. #SoleSurvivorFilm No matter how bad your situation is, there's always someone who's worse off than you.